Welcome to Golden Boy Pies! We are a commercial wholesale bakery dedicated to the production and distribution of top quality desserts. 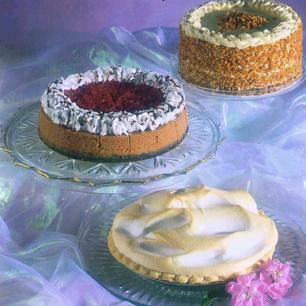 We offer a gourmet-quality line of fresh-baked pies, crisps, cakes, brownies, and pre-cut cheesecakes. From our plant and office in the <?xml:namespace prefix = st1 ns = "urn:schemas-microsoft-com:office:smarttags" />Kansas City Metro area, we deliver desserts to casinos, restaurants, hospitals, and plant cafeterias in Kansas, Missouri, Nebraska, Iowa, and Illinois. Golden Boy Pies desserts are suitable for almost any type of marketing: sit-down, carry-out, whole, or by the piece. And our quality is guaranteed!<?xml:namespace prefix = o ns = "urn:schemas-microsoft-com:office:office" /> You can sit back and watch your profits soar when Golden Boy Pies does your baking. Click here to read Snack Food & Wholesale Bakery's Feature on Golden Boy Pies! While Golden Boy Pies is a wholesale bakery, we also sell retail to the general public. Because we only bake what is ordered, if you would like to pick up desserts at our Overland Park location you must place your order by noon the day before you plan to pick up. Please remember we are only open Monday through Thursday, 8:00 am - 3:00 pm and Friday, 8:00 am-2:00 pm, so if you would like to pick up your desserts on Monday, you would need to order by noon on the preceding Friday. Make your last impression a memorable one with Golden Boy Pies! Copyright 2008-2014 Golden Boy Pies, Inc. You must obtain written permission to use any content on this page.